On Monday, Gov. Jay Inslee spoke with Tacoma schools Superintendent Carla Santorno and separately spoke with Washington Education Association President Kim Mead. "He listened to their concerns and positions," said an Inslee spokeswoman. Gov. Jay Inslee weighed in this week on the Tacoma teachers’ strike, which extended into its fifth day Wednesday. On Monday, Inslee spoke with Tacoma Superintendent Carla Santorno and separately spoke with Washington Education Association President Kim Mead. “He listened to their concerns and positions,” said Tara Lee, the governor’s deputy director of communications. “He encouraged them to come together and urged the parties to negotiate. Despite Inslee reaching out, there was no indication Tuesday the strike would end soon. Angel Morton, president of the Tacoma Education Association, said it all comes down to the district deciding to meet the union’s demands for salary increases. Dan Voelpel, a spokesman for Tacoma Public Schools, said Tuesday negotiations are continuing, but the two sides are still far apart. It’s not without precedent for a governor to intercede. In 2011, then-Gov. 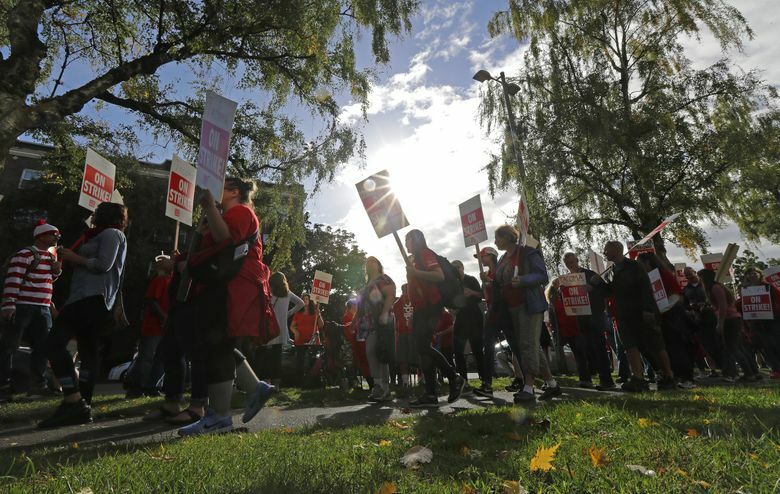 Christine Gregoire helped end a 10-day strike after ordering Tacoma school district officials and union leaders to her office for a marathon bargaining session. Across the state, teacher contract negotiations have been particularly fraught after lawmakers this year injected about $1 billion into the state’s K-12 budget to pay for educator salaries. The infusion of cash prompted the state Supreme Court to close the decadelong school-finance case known as McCleary. But the extra money also automatically opened teacher contracts for renegotiation in virtually all of the state’s 295 school districts.